PHOENIX – David Peralta might be a tough out for Major League pitchers, but the outfielder was no match for 12-year-old Corey Heartwell at air hockey. On their day off Tuesday, Peralta and Arizona Diamondbacks teammates Chase Anderson, Tuffy Gosewisch and Ender Inciarte hung out with patients in Phoenix Children’s Hospital’s Child Life Zone, playing video games, foosball and board games. They also visited visited children who couldn’t leave their rooms. Inciarte quickly found himself at the pool table with a teenage girl, who beat him. Heartwell got to know Anderson and Peralta by sweeping the pair in air hockey. Gosewisch helped a young girl finish her Sudoku. After a few minutes into the visit, it became hard to tell who was enjoying their time more. Inciarte was locked into a game of NBA2K like he had money on it, and Super Mario on Super Nintendo sparked an instant connection with Anderson and an 8-year-old boy. Anderson, whose wife played board games and made bracelets with patients during the visit, said he wants to coach at the youth level after he’s done playing and that his family looks forward to getting involved with the community whenever an opportunity arises. “It’s important for us to help out whenever we can,” he said. Anderson, Gosewisch, Inciarte and Peralta aren’t the only Diamondbacks who visit the hospital. Stacy Diller, a spokeswoman of the hospital, said All-Star first baseman Paul Goldschmidt regularly visits unannounced. “The kids love when athletes visit,” she said. The Diamondback's recent visit to the Phoenix Children's Hospital proved that both the players and patients can help influence each other. Cronkite News Reporter, Lacey Darrow, takes us inside the visit. 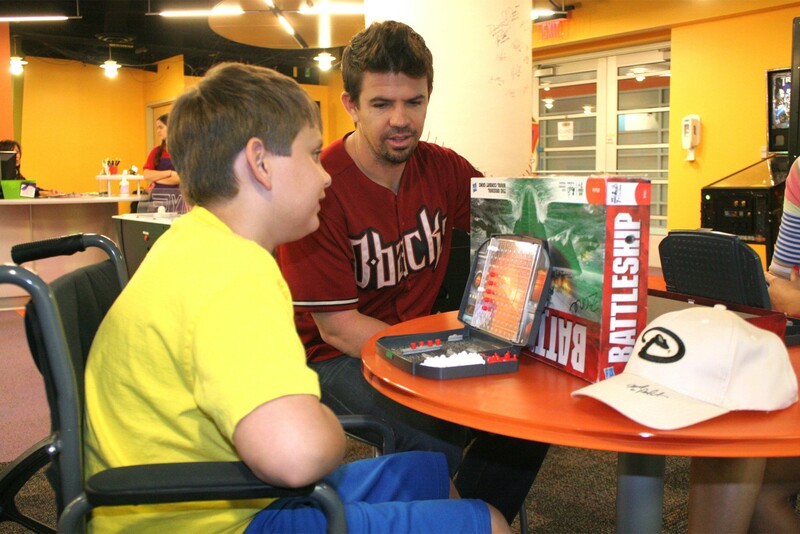 Arizona Diamondbacks catcher Tuffy Gosewisch plays a board game with a boy at Phoenix Children's Hospital.